Ever since I first started collecting coins, I’ve been checking penny rolls from banks and grocery stores for scarce and old coins. I don’t honestly know what prompted me to start doing that, especially as I was only a kid and no one had told me that searching rolls of coins is one of the most efficient and successful ways to make interesting finds in circulation. From wheat cents to foreign coins and off-center coins, too, I’ve found all types of scarce, unique, intriguing, and valuable old pennies in coin rolls. That’s why I’ll still trade in $5 or $10 in paper currency every so often for a handful of penny rolls from the bank, grocer, or whoever else has them. For 50 cents per penny roll, I get to enjoy the thrill of the hunt – the glimmer of exploration that twinkles the very second I pick open that first little flap of paper sealing one end of the coin wrapper. Of course, the types of worthy finds I am making now are a little different than those that I made 20 years ago. Back in the early and mid 1990s, if I bought a roll of Lincoln cents, I was pretty much guaranteed of finding at least one Lincoln wheat cent and several 1960s and 1970s Lincoln cents. Maybe it would take two Lincoln cent rolls to spot that first Lincoln wheat penny. At any rate, I knew that hunting through a roll of Lincoln cents would net me at least a few pieces to add to my blue, Whitman Lincoln Cent Volume Two (1941-1974) coin folder. Why, I even found several Lincoln cents advanced in age enough to find a proper home in my Lincoln Cent Volume One (1909-1940) coin folder. How about that? Noticing the incredible lack of wheat ears in my pocket change, I thought it was time to conduct an experiment. I would go to the bank, ask for 10 dollars in penny rolls, and record my findings. Just how many wheat cents, copper pennies (made before 1982), and other pieces would I find among a pool of 1,000 one-cent coins? Unfortunately, I never took exact notes of the coins that I found in bank rolls 15 or 20 years ago, so technically I had little more to go on than my memory. But, hey, it’s pretty hard to forget regularly finding at least one wheat cent in virtually every penny roll that I explored. So, I at least had that to go on! Now, obviously, over the course of 20 years, things will change. For example, the 1970s and 1980s did not seem nearly as retro in 1993 as those decades are today, so coins from that era just wouldn’t have seemed as “old.” And, most Lincoln cents from the 1960s had been in circulation for less than 30 years – the average lifespan of a coin. And as for the rest of the coins? They were all dated 1982 and after, meaning they are made primarily of zinc and have a copper coating. 196 coins were Lincoln cents that contain mainly copper. Then there was that oddball dime and that one-cent coin from the Great White North. So, by breakdown, 19.6 percent of the coins were made before 1982. That means an astounding 80.4 percent all were dated from 1982 or after; Lincoln wheat cents comprised a mere 0.4 percent of the finds among these 20 penny rolls. This is clearly an indication that many people, both coin collectors and non-collectors alike now hoard copper pennies, leaving behind the more modern copper-plated zinc coins to leverage the duties of feeding commerce with one-cent coins. With old-fashioned copper pennies each containing approximately 3 cents of copper, it’s no wonder as to why pre-1982 Lincoln cents are disappearing from circulation; this same circumstance befell silver coins, which vanished from pocket change during the second half of the 1960s after larger coin denominations were first struck with a copper-nickel clad composition. So, what does this mean for the future? 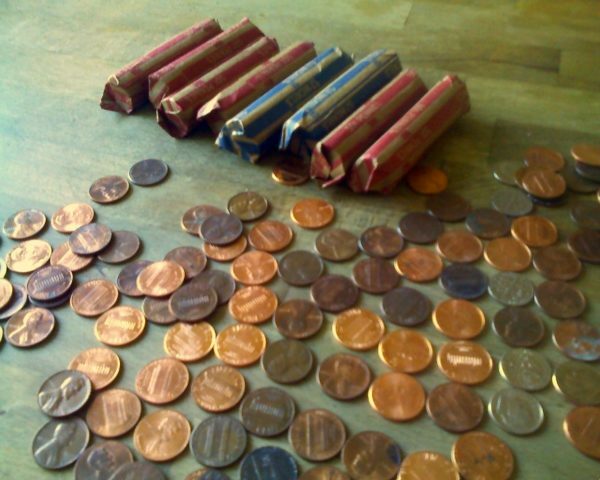 Will copper pennies become virtually extinct from circulation? We’ll have that answer when I do another penny roll exploration in, oh – another 20 years. I’m a roller coaster junkie, a weather enthusiast, a frequent traveler, and a numismatist. My love for coins began when I was 11 years old. I primarily collect and study U.S. coins produced during the 20th century. I’m a member of the American Numismatic Association (ANA) and the Numismatic Literary Guild (NLG). I’ve also been studying meteorology and watching weather patterns for years. I enjoy sharing little-known facts and fun stuff about coins, weather, travel, health, food, and living green… on a budget.